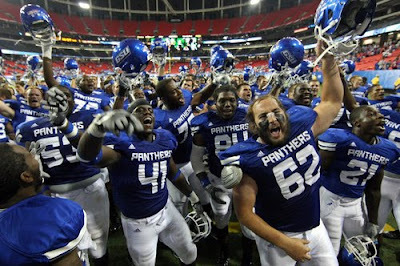 An Opinion On Sports: Georgia State Football: Unblemished! Georgia State has never lost a football game. That they have played only one is inconsequential at this point . The Panthers routed their inaugural opponent, Shorter College, 41-7 Thursday night in the Georgia Dome before a surprisingly large crowd of more that 30,000. Head coach Bill Curry returned to the sidelines after a 14 year hiatus, and saw his new outfit play with intensity and precision. Sounds to me like they are ready to challenge Georgia Tech for the city title at any time now. The winner could receive the "Golden Dome" trophy. Go State!